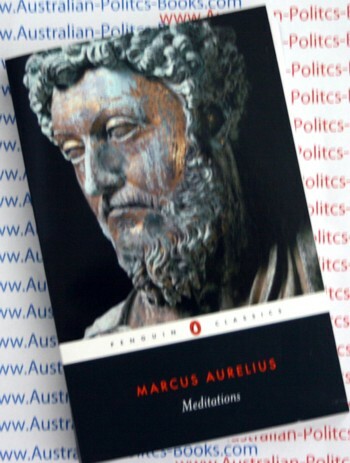 Meditations is the title of a series of personal writings by Marcus Aurelius setting forth his ideas on Stoic philosophy. Marcus Aurelius wrote the 12 books of the Meditations in "highly-educated" Koine Greek as a source for his own guidance and self-improvement. It is possible that large portions of the work were written in Sirmium, where he spent much time planning military campaigns from 170 to 180. We know that some of it was written while he was positioned at Aquincum on campaign in Pannonia, because internal notes tell us that the second book was written when he was campaigning against the Quadi on the river Granova (modern-day Hron) and the third book was written at Carnuntum. It is not clear that he ever intended the writings to be published, so the title Meditations is but one of several commonly assigned to the collection. These writings take the form of quotations varying in length from one sentence to long paragraphs. His stoic ideas often revolve around the denial of emotion, a skill which, he says, will free a man from the pains and pleasures of the material world. He claims that the only way a man can be harmed by others is to allow his reaction to overpower him. He shows no particular religious faith in his writings, but seems to believe that some sort of logical, benevolent force organizes the universe in such a way that even "bad" occurrences happen for the good of the whole. Marcus Aurelius has been lauded for his capacity "to write down what was in his heart just as it was, not obscured by any consciousness of the presence of listeners or any striving after effect." Gilbert Murray compares him to Rousseau and St. Augustine and their Confessions. Though Murray criticizes Marcus for the "harshness and plainness of his literary style," he finds in his Meditations "as much intensity of feeling...as in most of the nobler modern books of religion, only [with] a sterner power controlling it." "People fail to understand Marcus," he writes, "not because of his lack of self-expression, but because it is hard for most men to breathe at that intense height of spiritual life, or, at least, to breathe soberly." D.A. Rees calls the Meditations "unendingly moving and inspiring", but does not offer them up as works of original philosophy. Bertrand Russell found them contradictory and inconsistent, evidence of a "tired age" where "even real goods lose their savour." Using Marcus as an example of greater Stoic philosophy, he found their ethical philosophy to contain an element of "sour grapes". "We can't be happy, but we can be good; let us therefore pretend that, so long as we are good, it doesn't matter being unhappy." Both Russell and Rees find an element of Marcus' Stoic philosophy in Kant's own philosophical system. Gregory Hays' translation of Meditations for The Modern Library made the bestseller list for two weeks in 2002. * If thou art pained by any external thing, it is not this that disturbs thee, but thy own judgment about it. And it is in thy power to wipe out this judgment now. * A cucumber is bitter. Throw it away. There are briars in the road. Turn aside from them. This is enough. Do not add, "And why were such things made in the world?" * Soon you'll be ashes or bones. A mere name at most--and even that is just a sound, an echo. The things we want in life are empty, stale, trivial. * Never regard something as doing you good if it makes you betray a trust or lose your sense of shame or makes you show hatred, suspicion, ill-will or hypocrisy or a desire for things best done behind closed doors. * Let opinion be taken away, and no man will think himself wronged. If no man shall think himself wronged, then is there no more any such thing as wrong. * (...) As for others whose lives are not so ordered, he reminds himself constantly of the characters they exhibit daily and nightly at home and abroad , and of the sort of society they frequent; and the approval of such men, who do not even stand well in their own eyes has no value for him. * Whatever happens to you has been waiting to happen since the beginning of time. The twining strands of fate wove both of them together: your own existence and the things that happen to you. * Do not act as if thou wert going to live ten thousand years. Death hangs over thee. While thou livest, while it is in thy power, be good. * Do not then consider life a thing of any value. For look at the immensity of time behind thee, and to the time which is before thee, another boundless space. In this infinity then what is the difference between him who lives three days and him who lives three generations? * When you wake up in the morning, tell yourself: The people I deal with today will be meddling, ungrateful, arrogant, dishonest, jealous, and surly. They are like this because they can't tell good from evil. But I have seen the beauty of good, and the ugliness of evil, and have recognized that the wrongdoer has a nature related to my own-not of the same blood or birth, but the same mind, and possessing a share of the divine. Marcus Aurelius Antoninus Augustus (often referred to as "the wise") (April 26, 121 – March 17, 180) was Roman Emperor from 161 to his death in 180. He was the last of the "Five Good Emperors", and is also considered one of the most important Stoic philosophers. His tenure was marked by wars in Asia against a revitalized Parthian Empire, and with Germanic tribes along the Limes Germanicus into Gaul and across the Danube. A revolt in the East, led by Avidius Cassius, failed. He was originally named Marcus Annius Catilius Severus, when he married he took the name Marcus Annius Verus.When he was named Emperor, he was given the name Marcus Aurelius Antoninus. Marcus Aurelius was the only son to Marcus Annius Verus and Domitia Lucilla. His only natural sibling was his younger sister Annia Cornificia Faustina, who was about 2 years younger than he. Domitia Lucilla came from a wealthy family who were of consular rank. Marcus Aurelius' father was of Spanish origin, and served as a praetor and died when Marcus was three years old. Marcus Aurelius credits him with teaching him "manliness without ostentation". His father's maternal aunt was Vibia Sabina, wife of Roman Emperor Hadrian. Rupilia Faustina (Marcus Aurelius' paternal grandmother) and Vibia Sabina were half-sisters and were daughters of Salonina Matidia (niece of the Roman Emperor Trajan). His father's sister was Faustina the Elder a Roman Empress who married the Roman Emperor Antoninus Pius. After his father's death, Aurelius was adopted and raised by his mother and paternal grandfather Marcus Annius Verus. His paternal grandfather died in 138; he was almost ninety years old. In 136, Hadrian had announced that his eventual successor would be Lucius Ceionius Commodus, renamed L. Aelius Caesar. Marcus had already attracted the attention of Hadrian (who had nicknamed him verissimus, which translates as "truest") and had been made a member of the equestrian order when he was six; he was subsequently engaged to Ceionia Fabia, Commodus' daughter. The engagement, however, was annulled later after the death of Commodus, as Marcus was betrothed to Antoninus' daughter. Therefore, on the death of Hadrian's first adopted son L. Aelius Verus, Hadrian made it a precondition of making Antoninus his successor that Antoninus would adopt Marcus (then called Marcus Aelius Aurelius Verus) and Lucius Ceionius Commodus (Lucius Aelius' son, ten years junior than Marcus, renamed Lucius Aurelius Verus), and arrange for them to be next in the line. This Antoninus did, adopting and designating them as his successors on February 25, 138, when Marcus was only seventeen years of age. He would become emperor at 40. It has been suggested that Commodus and Antoninus Pius were designed by Hadrian only as "place warmers" for the young Marcus and Verus. Marcus received an education from some of the greatest scholars of his day: Euphorion for literature, Geminus for drama, Andron for geometry, Caninius Celer and Herodes Atticus in Greek oratory, Alexander of Cotiaeum for Greek, and Marcus Cornelius Fronto for Latin. It is through Marcus' correspondence with Fronto that we have many of the details of his life during the reign of Antoninus. Through these letters Marcus appears as an intelligent, serious-minded and hardworking youth. They also show the growing importance of philosophy for the future emperor: showing impatience for the unending exercises with Greek and Latin declamations, he later became fond of the Diatribai ("Discourses") of Epictetus, an important moral philosopher of the Stoic school. Marcus also started to have an increasing public role at the side of Antoninus, holding the place of consul in 140, 145 and 161 and increasing collaboration in decisions. In 147 he received the proconsular imperium outside Rome and the tribunicia potestas, the main formal powers of emperorship. In 145, Marcus married Annia Galeria Faustina or Faustina the Younger, who was Antoninus' daughter and his paternal cousin. When Antoninus Pius died (March 7, 161), Marcus accepted the throne on the condition that he and Verus were made joint emperors (Augusti). Though formally equal from the constitutional point of view, Verus, younger and probably less popular, looks to have been subordinate in practice. Marcus' insistence to have Verus elected with him was motivated by his loyalty towards the will of their adoptive father. The joint succession may have also been motivated by military experiences, since, during his reign, Marcus Aurelius was almost constantly at war with various peoples outside the empire. A highly authoritative figure was needed to command the troops, yet the emperor himself could not defend both the German and Parthian fronts at the same time. Neither could he simply appoint a general to lead the legions; earlier popular military leaders like Julius Caesar and Vespasian had used the military to overthrow the existing government and install themselves as supreme leaders. Marcus Aurelius solved the problem by sending Verus to command the legions in the east. Verus was authoritative enough to command the full loyalty of the troops, but already powerful enough that he had little incentive to overthrow Marcus. Verus remained loyal until his death on campaign in 169. This joint emperorship was reminiscent of the political system of the Roman Republic, which functioned according to the principle of collegiality and did not allow a single person to hold supreme power. Joint rule was revived by Diocletian's establishment of the Tetrarchy in the late 3rd century. Immediately at the beginning of his reign, Marcus continued on the path of his predecessors by issuing numerous law reforms, mainly to clear away abuses and anomalies in the civil jurisprudence. In particular he promoted favourable measures towards categories like slaves, widows and minors; recognition to blood relationships in the field of succession was given. In the criminal law a distinction of class, with different punishments, was made between honestiores and humiliores ("The more distinguished" and "the more lowly", respectively). Under Marcus' reign, the status of Christians remained the same since the time of Trajan. They were legally punishable, though in fact rarely persecuted. In 177 a group of Christians were executed at Lyon, for example, but the act is mainly attributable to the initiative of the local governor. In Asia, a revitalized Parthian Empire renewed its assault in 161, defeating two Roman armies and invading Armenia and Syria. Marcus Aurelius sent his joint emperor Verus to command the legions in the east to face this threat. The war ended successfully in 166, although the merit must be mostly ascribed to subordinate generals like Gaius Avidius Cassius. On the return from the campaign, Verus was awarded with a triumph; the parade was unusual because it included the two emperors, their sons and unmarried daughters as a big family celebration. Marcus Aurelius' two sons, Commodus five years old and Annius Verus of three, were elevated to the status of Caesar for the occasion. Starting from the 160s, Germanic tribes and other nomadic people launched raids along the Northern border, particularly into Gaul and across the Danube. This new impetus westwards was probably due to attacks from tribes farther east. A first invasion of the Chatti in the province of Germania Superior was repulsed in 162. Far more dangerous was the invasion of 166, when the Marcomanni of Bohemia, clients of the Roman Empire since 19, crossed the Danube together with the Lombards and other German tribes. At the same time, the Iranian Sarmatians attacked between the Danube and the Theiss rivers. Due to the situation in the East, only a punitive expedition could be launched in 167. Both Marcus and Verus led the troops. After the death of Verus (169), Marcus led personally the struggle against the Germans for the great part of his remaining life. The Romans suffered at least two serious defeats by the Quadi and Marcomanni, who could cross the Alps, ravage Opitergium (Oderzo) and besiege Aquileia, the Roman main city of north-east Italy. At the same time the Costoboci, coming from the Carpathian area, invaded Moesia, Macedonia and Greece. After a long struggle, Marcus Aurelius managed to push back the invaders. Numerous Germans settled in frontier regions like Dacia, Pannonia, Germany and Italy itself. This was not a new thing, but this time the numbers of settlers required the creation of two new frontier provinces on the left shore of the Danube, Sarmatia and Marcomannia, including today's Bohemia and Hungary. The emperor's plans were, however, prevented by a revolt in East, led by Avidius Cassius, which was prompted by false news of the death of Marcus after an illness. Of the eastern provinces, only Cappadocia and Bithynia did not side with the rebels. When it became clear that Marcus Aurelius was still alive, Cassius' fortunes declined quickly and he was killed by his troops after only 100 days of power. Together with his wife Faustina, Marcus Aurelius toured the eastern provinces until 173. He visited Athens, declaring himself a protector of philosophy. After a triumph in Rome, the following year he marched again to the Danubian frontier. After a decisive victory in 178, the plan to annex Bohemia seemed poised for success but was abandoned after Marcus Aurelius again fell ill in 180. Marcus Aurelius died on March 17, 180, in the city of Vindobona (modern Vienna), his son and successor Commodus accompanying him. He was immediately deified and his ashes were returned to Rome, and rested in Hadrian's mausoleum (modern Castel Sant'Angelo) until the Visigoth sack of the city in 410. His campaigns against Germans and Sarmatians were also commemorated by a column and a temple in Rome. Marcus Aurelius was able to secure the succession for Commodus, whom he had named Caesar in 166 and made co-emperor in 177, though the choice may have been unknowingly unfortunate. This decision, which put an end to the fortunate series of "adoptive emperors", was highly criticized by later historians since Commodus was a political and military outsider, as well as an extreme egotist with neurotic problems. For this reason, Marcus Aurelius' death is often held to have been the end of the Pax Romana. It is possible that he chose Commodus simply in the absence of other candidates, or as a result of the fear of succession issues and the possibility of civil war.